Turquoise has been worn for thousands of years as an amulet for protection, strength and good health. It is still worn as a stone of protection and preventer of accidents, and can also be used to cleanse negative energy, including electromagnetic energy. Turquoise is calming and balancing, supports the immune system, and treats infections and illness – especially sore throat, colds, and upper respiratory infection. It can also support the thyroid. It lifts the spirits, helps release anger and fear, stabilises mood swings, and can be supportive when exhausted or overworked. 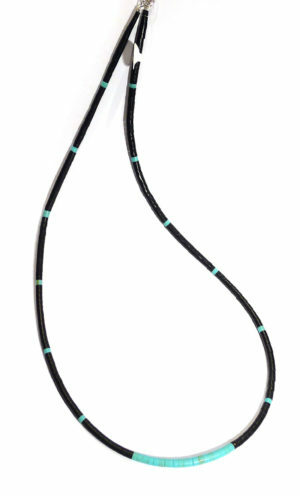 Turquoise aids communication and speech, especially if worn near the throat. Traditionally, it is used to treat eye infection and improve eyesight. Ruby was the Capricorn birthstone, and onyx or turquoise the birthstone for Leo, up until 1912, when the National Association of Jewellers (US) swapped them on the basis that a lighter-coloured stone would be more suitable for the winter months. This has been accepted practice ever since. Turquoise is one of the birthstones for December, and so is also associated with Sagittarius. Turquoise is a secondary (sedimentary) mineral that forms in arid regions, probably as a result of the oxidation and weathering decomposition of already existing minerals. The copper content is likely to originate from existing copper sulphides such as chalcopyrite, or copper carbonates such as malachite; the potassium is probably from apatite; the aluminium from feldspar. The material is then deposited in veins or cavities through water circulation. The colour varies from sky blue to green, depending on the proportion of iron to copper, and possibly aluminium. Because of this, turquoise was reclassified in 1998 as a group of similar minerals with slight variations in chemical formula. It usually occurs in massive or microcrystalline forms, with no definite external shape. Crystals are extremely rare, and when they form, are usually no more than 2 mm in length – but exquisitely beautiful (see http://www.mindat.org/min-4060.html). 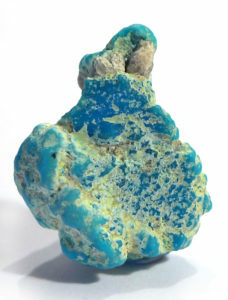 Turquoise varies in hardness, depending on the mine. Iranian turquoise is hard and easy to work. In the Americas it tends to be chalky, and prone to breakage, so large cabochons are often backed with resin. It is also ‘stabilised’ by impregnating it with wax or resin. This makes it easier to work, but alters the colour and consistency, so the method is usually restricted to jewellery from the lower end of the market. The delicate veining in some turquoise is caused by impurities, but that originating from some localities is actually sought after. Most of the US mines have been mined out and are no longer operating. Sleeping Beauty Mine in Arizona still is, and has some of the purest and most popular sky blue turquoise (see main photo). Unfortunately, with the rising price of copper, in 2012 the owners took the decision to cease selling the gemstone, and crush all material for smelting. Since that time, the value of Sleeping Beauty turquoise has risen considerably. 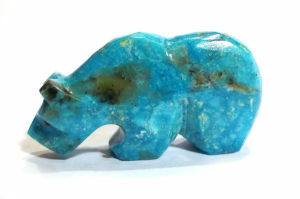 Turquoise is carved and sculpted, but most often is used in jewellery making. Most pieces are cut en cabochon, or inlaid in silver with other stones. Most turquoise is porous, and will react with acid on the skin, detergents and oils. Remove turquoise rings when washing your hands or doing the washing up, and take general care when handling it. It is safe to use directly in water when making an essence, but it’s probably best to use an indirect method in case it affects the stone. The modern name “turquoise” originates from the French for “Turkish”, as the stone first entered Europe through trade routes that passed through Turkey, and was probably believed to have originated there. The first recorded use of this name was by the 13th century author Arnoldus Saxo. He described a stone called turcois, which he said protects the eyes and induces hilarity. Pliny the Elder (1st century AD) writes of callais, a stone whose description sounds very much like turquoise. Turquoise is one of the first gemstones to be mined solely for ornamental and decorative purposes. Turquoise beads have been found in Mesopotamia (modern day Iraq) dating from around 5,000 BC. It was highly prized by the Ancient Egyptians, who mined it in the Sinai Peninsula from at least the First Dynasty (about 3,000 BC), and there are numerous examples of objects adorned with turquoise from throughout the Egyptian period, including the famous gold burial mask of Tutankhamun. In the Egyptian pantheon, it was aligned mainly with the goddess Hathor, but was also symbolic of other Egyptian deities. An important source of turquoise was Persia (Nishapur, in what is now Iran), where it was mined for at least 2,000 years. There it was known as ferosah or firohah, both of which mean “victorious”. The material from this area is relatively hard and very blue. Larger pieces were engraved, sometimes with passages from the Koran, and often inlaid with gold. It was used to decorate ornamental objects of every description, including saddles and bridles, swords and knife hilts, bowls, goblets, and even thrones, and was also used to cover the domes of palaces, presumably to symbolise heaven on earth. According to Kunz in The Curious Lore of Precious Stones, the Persians believed turquoise set into a bridle would make the horse more sure-footed and not prone to falling. Turquoise has been mined in China since about 3,000 years ago, when it was worn by the nobility, but was not (and still isn’t) highly prized, because of being considered inferior to jade. There is a good quality deposit of green turquoise in Tibet. Tibetans call it gyu, similar to the Chinese yu for jade, which also translates as “precious stone”. The colour (rather than the stone) figures much in Tibetan lore. Tibetan shamans believe it protects all things, earthly and spiritual. The Aztecs held turquoise in the same high regard as emerald and jade. It was used to decorate temples and make ceremonial masks and ornaments. Turquoise powder was added to water, and drunk to treat weakness and nausea. The greatest source of turquoise lore comes from the Native Americans of Southwest USA, possibly because the culture is still active. Turquoise has been mined in the area since around 1,000 AD. The Anasazi (ancient pueblo people) of Chaco Canyon, New Mexico, became very wealthy trading turquoise ornaments at this time. George H Pepper, a 19th century archaeologist, recorded finding 24,932 turquoise beads during one excavation in 1896. Turquoise is still of great importance to the pueblo inhabitants, as well as the Navajo, Zuni and Hopi tribes. Each tribe ascribes slightly different qualities to it. General beliefs are: the blue colour is the colour of the sky (some say it has been stolen from the sky), and a piece of turquoise fastened to the shaft of an arrow or stock of a gun will make the aim true. For most it is believed to bring protection and good luck. 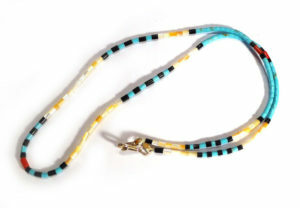 The majority of fetishes (animal carvings) used in the spiritual practice of Zuni and some other tribes have turquoise eyes, and are ceremonially fed ground maize and ground turquoise. The Hopis believe that blue turquoise is masculine and green, feminine. It was sometimes believed to bring rain in periods of drought. 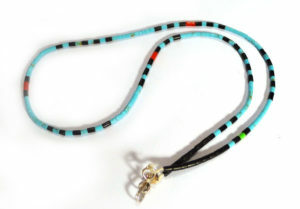 Turquoise fixed to a horse’s bridle will prevent the horse falling or the rider being thrown, and will prevent colic if the horse drinks cold water. Worn as jewellery, it will prevent falls, accidents, and accidental death – in this case, the turquoise is believed to bear the brunt of the fall, and if it breaks it shows it has done this job. Turquoise can be used to improve eyesight, and prevent and treat eye infection. It is said to change colour to indicate a change in health or weather, and signal impending danger. In almost all cases, up until the 19th century, turquoise was said to be a masculine stone. When it was set in jewellery and given by a man to a woman, it represented the forget-me-not, symbolising “I will not forget you”.